The cover of Plant: Exploring the Botanical World is compelling with its eye-catching, embossed kaleidoscope of floral and leaf images set against a simple black background. This year marks the 300th anniversary of the birth of Lancelot Brown (1716–1783). 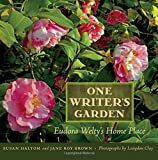 This gorgeous book is meant for anyone who is an aspiring gardener or an expert horticulturist, regardless of green-thumb abilities or current state of a reader’s yard or window box. Philippa Pearson’s Small Space Garden Ideas is an archive of perfectly formed ideas for indoor and outdoor garden inspiration. “Rebecca Rupp has done us the favor of serving up a savory history of something many of us don’t think much about—vegetables. . . .
“Weeds, therefore, makes a quiet and enlightening read, enjoyable in one gulp if you’re an enthusiast or in small doses if you’re new to the subject.